Right now there are two main types of virtual reality headsets, ones that are tethered to PCs and ones that need a smartphone to work. Either way, such headsets are beholden to another device running the show, which also prevents users from accessing said devices normally. Standalone VR headsets have long been a dream but, as far as Google’s Daydream platform is concerned, that almost failed to take shape. Lenovo has, fortunately, come to the rescue with the new Mirage Solo with Daydream standalone headset that promises freedom in more ways than one. The problem with most VR headsets goes beyond just being dependent on a separate device. That also touches on the problem with tracking. PC-based platforms often have beacons and sensors stationed at certain parts of an area, requiring the user to remain tethered to that location as well as to a computer. While phone-based headsets have more freedom of movement, they are limited to what the phone’s motion and gyro sensors are able to detect. Inside-out tracking, popularized by Microsoft’s HoloLens and then its Windows Mixed Reality, solves those limitations. Lenovo calls it “WorldSense”. By using a combination of built-in cameras and a set of sensors, the Lenovo Mirage Solo is able to accurately track its, and therefore the wearer’s head’s, position in 3D space. In short, you can dodge, bank left, or jump, and all of that will be tracked and interpreted by the platform. Part of the freedom promised by the Mirage Solo is thanks to its hardware, which is practically a smartphone built inside the VR headset. It is powered by a Snapdragon 835 processor, designed for VR experiences, with 4 GB of RAM and 64 GB of built-in UFS storage. The display is a 5.5-inch 2560×1440 WQHD display. And there are a couple of connectivity options, both wired and wireless, for audio and data. Being a Daydream headset, it also comes with a compatible Daydream controller. Design-wise, the Lenovo Mirage Solo looks more like a Windows Mixed Reality headset than any iteration of Google Cardboard or Daydream we’ve seen. Unlike the latter, the headset isn’t front-heavy and has been designed to distribute the weight evenly all throughout. There’s also some breathable padding in areas where the headset touches the skin, though it remains to be seen how fast that will become a grime depository. Fancy hardware would be meaningless if it didn’t have the software to utilize it. And, let’s face it, Google Daydream isn’t exactly the most prolific VR platform out there. Lenovo promises that a suite of apps will be coming soon to expand the platform, though that will happen closer to the device’s release in the second quarter. If that isn’t enough, however, Lenovo has another Daydream device ready. The Mirage Camera is no headset, though it might look like a collapsed Google Cardboard. 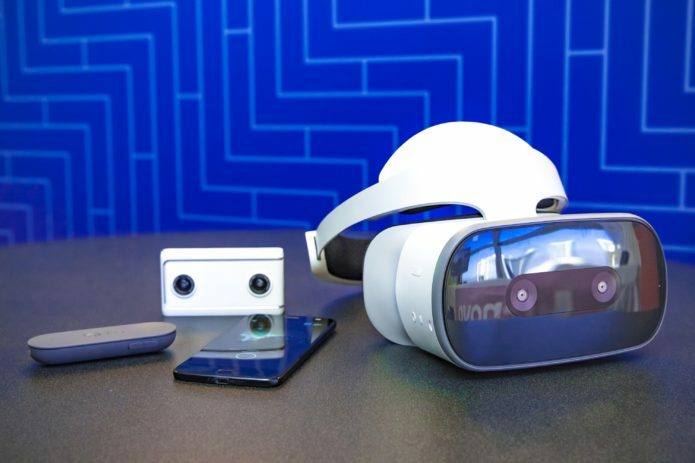 As the name implies, it’s simply a camera designed to capture and record content that can be best viewed by a Dayream headset, like the Lenovo Mirage Solo, of course. What makes the Mirage Camera with Daydream different from both regular cameras and VR cameras is that it isn’t a 360-degree camera. In fact, it’s a 180-degree camera only. This VR180 system was developed initially for YouTube as a way to record and play video that would look perfectly normal on any “flat” display, like a computer monitor or smartphone, but still had the 3D effect when watched inside a VR headset. Hardware-wise, the Mirage Camera itself is like a screen-less phone, with a Qualcomm Snapdragon 626, 2 GB of RAM, 16 GB of expandable eMMC storage, and dual 13 megapixel cameras with 180×180 degrees field of vision. Both Lenovo Mirage devices wiill go on sale sometime in the second quarter of the year. The Mirage Solo with Daydream will retail for $400, which is way below the price of a 2017 flagship plus a $99 Google Daydream View headset. The Mirage Camera with Daydream, on the other hand, might have a price tag that’s a bit harder to swallow at $300.